Easy to access, easily reversible, can assist with managing periods. Highly user dependent, may cause side effects, requires a script. The combined oral contraceptive pill contains oestrogen and progestogen. The oestrogen prevents the ovaries from releasing an egg. The progestogen works to thicken the cervical mucous which prevents sperm from getting through into the uterus. Most versions of The Pill have a hormone free break on the tablet sheet, which means you get a regular period every 3 weeks. 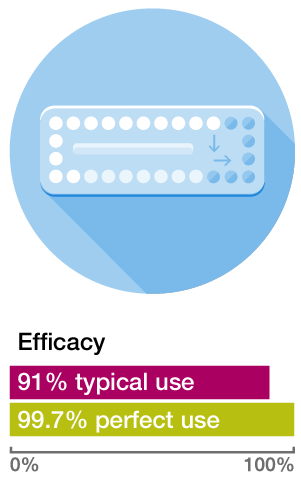 The Pill remains one of the most popular methods of contraception for Australian women, however it’s important to note that its efficacy does drop significantly when not used perfectly. Tip: To remember to take your pill, place it somewhere that you have to go every day (e.g. next to your toothbrush) and make sure you carry a couple of spares in your wallet in case you’re caught short. Step 1. The combined oral contraceptive pill comes in a huge variety of different forms. There are different brands with different types and amounts of hormone, and different styles of packaging, all of which require a script to purchase from the chemist. You will need to make an appointment with your doctor to discuss which type of Pill is best for you, and get a prescription. Step 2. Once you have a script for the pill, make sure that you discuss with your GP or Pharmacist the correct way to take what you’ve been prescribed, as it’s important to start it at the right point in your cycle, and you’ll need to know how long to take it for before you’re protected against pregnancy. Step 3. To avoid falling into the “typical” rate of efficacy for The Pill, you need to remember to take it every single day. For some people this means leaving it next to their coffee mug, or toothbrush. For other people this means setting an alarm to remind them. If you’re concerned that you won’t remember it every day, you may want to consider a different method of contraception.